Hello Vintage: Bright yellow bliss! my thrifty find of the month! Master M: What is it? Me: It's a type writer, we used to use it to type letters on before we had computers. Master M: Is it a computer? Me: No before we had computers we used a typewriter to type letters. Master M: Oh. Look Mum it is getting stuck. Me: Yes, you can only press one letter at a time. Master M: Oh. What does this say 'kjfjiueoonuug'. Hmm, this old thing might be a bit educational, I think that justifies going back and getting the old Olivetti one I also saw stashed in the old lady's shed. Yeah! Linking for Flea Market Finds at Her Library Adventures. I seem to be getting into a bit of a habit lately on my way to work. There is an op shop that I have been popping into now and again. Well actually probably once a week (I only work two days a week). I picked up a few things last week that I will have to post here soon. One thing I have actually photographed is this Snowflake dish ($6). One lady picked up a SylvaC green bunny figurine for $5 that was ready to go out on the shelf. She beat my by about 10 seconds the lucky lady! 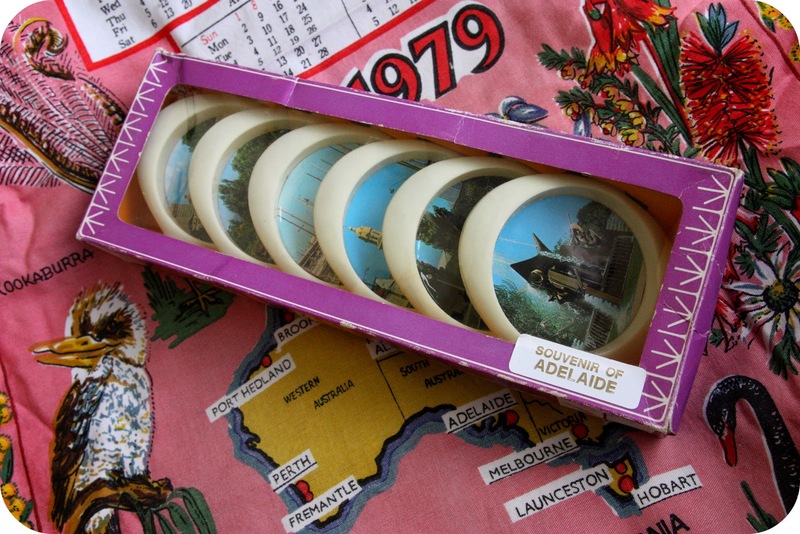 I received a parcel in the mail this week from Kylie at Lucy Violet Vintage who was giving away these vintage Adelaide souvenirs. Look how they came to me, all wrapped up in a vintage 1979 tea towel. I think this is pretty cool as I only have one other vintage tea towel I have is one that was left at my house that nobody is owning up to. I am pretty sure it's my Mums but she swears it's not. Her loss! In other news...I stuck my head out of our extension door the other day to show the electricians where the other entrance is. About a two metres behind them was this little fluff ball sitting in the tree. 'Hey, look behind you'! The electricians were so excited and were like tourists snapping pics with their phones. 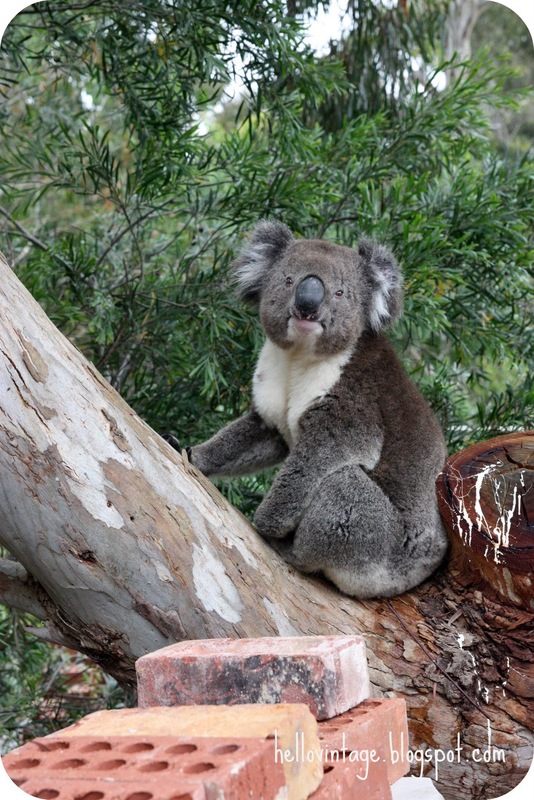 The koala got a little huffy and climbed up the tree however I found him sitting in the same spot later in the day. This is the closest I have ever seen him. He is posing for me in this picture. Lets give him a little bit of Christmas spirit! Hee hee, sorry, couldn't help myself! I haven't seen him for a while which is fine as he had been keeping me awake at night. I never knew koalas are so noisy! That typewriter is so GREAT !!! Love the Koala - with Christmas additions too. Oh Sherry, he is soooo cute all dressed in his santa hat...I'd be taking lots of photos too! The typewriter is super cool. P.s.I could not email direct, but I am more than happy for you to used the plates in the frame idea, anytime. I love the yellow snowflake dish. 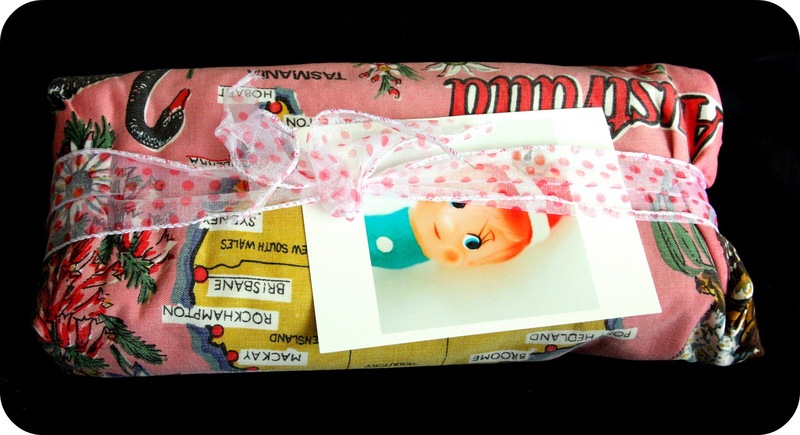 So perfect for Christmas! loving the Chrissie Koala! As for that typewriter ... can you imagine how much more fun it would have been to go to the office and see that little ray of sunshine sitting on your desk? So sorry... that was just my jaw hitting the floor...! I adore that typewriter!! that typewriter is gorgeous! I can't believe how close the koala was, he looks very festive he he. A lovely typewriter, made perfect in the sweetest of yellows. Wow! I love the yellow type writer! Fabulous! YOU luck thing!!! I've been trying to manifest a typewriter for myself!! So can you still get all the maintenance stuff for it (like ink etc.)? A merry, merry Christmas to you! Thanks for all the comments on my lovely typewriter. I know that I can get the ribbon for the Olivetti one no worries (on eBay) and pretty sure I can for the yellow one as I saw the same one sell on eBay with a new ribbon. Fingers crossed!